District Governor Ricardo Loretta presented on July 25th. Taco has been around the District a bit – recalls going to Lisbon with Armand during their year as club presidents. Taco claims to have no particular “word of wisdom,” but offered a short story based on his question “Why am I in Rotary? Are we pre-wired for service?” His answer is no – he thinks service as a passion came up around the middle of the 19th century. He tells a story of a Swiss businessman named Henry Dunant who witnessed the results of a war in South America. He found himself wanting to help the victims of the event, which eventually led him to be one of the founders of the International Red Cross. He wrote a book about the tragedies of war that continues to be popular today – “A Memory of Solferino.” Henry received one of the first Nobel Peace Prizes in 1901. Interestingly, this notion of service to the community and the world led Paul Harris to found Rotary in 1905. Ricardo has lived around the world in his position distributing products for Clark Equipment. Early in his career, he led a trip to China, and was very successful there. 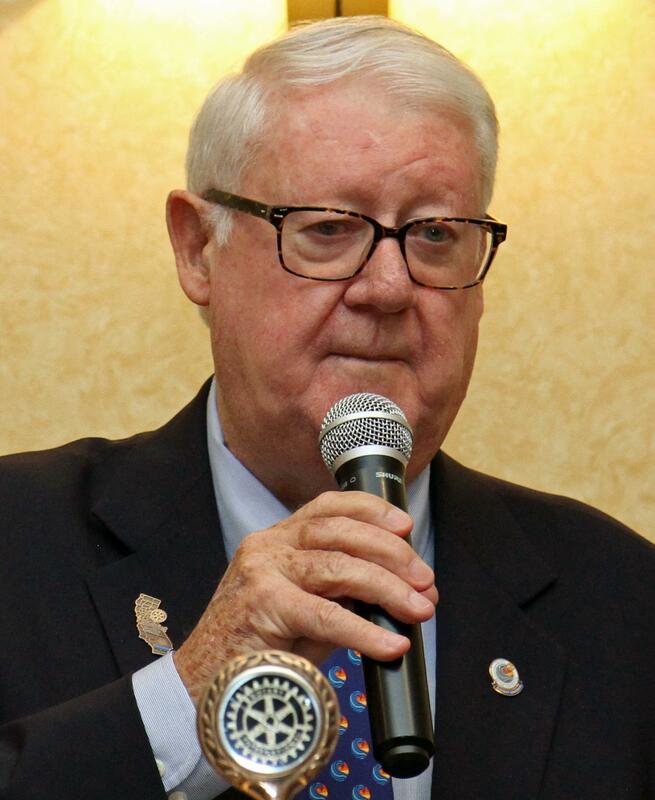 One of the executives of the company had him tell the story of his success to the local Rotary club, which earned him a Rotary pin – and a welcome from Rotary clubs world-wide. Living outside the US for a number of years, Taco returned to the states in 2009, and re-joined Rotary – and was delighted to find that women were now welcomed as members! He came in contact with a group that was passing out food baskets to the poor in the Coachella Valley – and started to help. It has become his clubs main project – and has grown to be a big factor in the valley. Ricardo says that his membership in Rotary made many of the best experiences in his life possible. Ricardo presented a small replica of the Rotary bell to Rory. The bell was forged in the same shop that makes bells for the Vatican in Italy. Rick Miller and Jamie Zinn were recognized as "Unsung Heroes" by Ricardo. One final comment – Ricardo says the most important person in the room is Bill Herrmann – our membership chair!